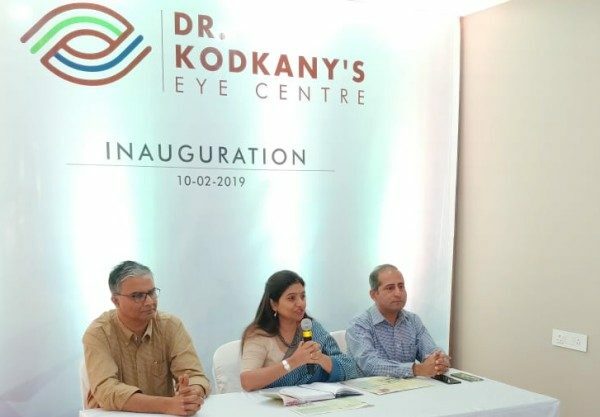 Renowned Eye Care Hospital, Dr. Kodkany’s Eye Centre (KEC), established by Dr. Shilpa Kodkany in the year 2000, and located at Maruti Galli is opening a newly constructed Branch at Ayodhya Nagar, Belagavi, on 10 February2019 in a modern building with advanced equipment and latest practices such as Zepto Cataract surgeries for the first time in Belagavi. Zepto Cataract surgeries (New Level of Precision for superior visual outcomes) now in 2019. Paediatric Ophthalmological Services in 2019. The newly constructed KEC Branch at Ayodhya Nagar is equipped with state-of-the-art investigative and surgical equipment that will help patients get accurate diagnoses and treatment. KEC has recently been granted permission from the Government of Karnataka for Keratoplasties (Corneal Transplantation) under the Human Organ Transplant Act (HOTA). KEC was the first private hospital in Belagavi to be accorded this permission. In addition to this, KEC has been accredited by National Accreditation Board for Hospitals and Healthcare Providers (NABH). Padmashree Dr. M. M. Joshi, Chairman M. M. Joshi Eye Institute, Hubballi. Ms. Mrinal Kulkarni, Noted Actor/Director, and Youth Icon. In addition to General Ophthalmological Services, the newly constructed KEC Branch at Ayodhya Nagar will provide Specialty Clinics for Cornea, Glaucoma, Cataract and Refractive Surgeries, Paediatric Ophthalmology, and Retina. An innovation that will be implemented at the newly constructed KEC Branch at Ayodhya Nagar will be Zepto Cataract Surgeries – This is Latest technology that will enable making openings in the cataract in an automated and extremely precise manner. This will facilitate an extremely precise centering of the intraocular lens when implanted, thus giving the much better visual outcome. Dry Eye evaluation and management with state of the art technologies. Paediatric Ophthalmological services for squint correction, congenital cataract, and screening of early born babies for Retinopathy of Prematurity (ROP). Low vision aids with special types of lenses/spectacles which help patients with vision impairment where visual recovery with any other treatment option is not possible.